[W]e appreciate your patience as we waited for the official, double-checked and final scoresheets from the fall convention. They are here, and you can download the sheets at the links below. Note: After Hours qualifies for the 2015 International Quartet Competition. Drive Time is the 2014 Illinois District Quartet Champion. Note: Tribute is the 2014 Illinois District Seniors Quartet Champion. 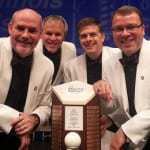 Take Note qualifies for the 2015 International Seniors Quartet Competition. At Least We’re Loud! is the 2014 Illinois District Novice Quartet Champion. Happy Hour was the mic tester quartet for the finals. Bloomington qualifies for the 2015 International Chorus Competition. Chicagoland West Suburban is the 2014 Illinois District Chorus Champion. Rockford Metro is the winner of the Gene McNish Small Chorus Award. 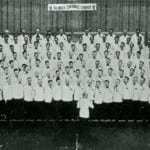 Elgin is the Most Improved Chorus.